The spectacular scenery, great beaches and little coves, water sports, friendly villages, mountains and nature reserve provide a great contrast to the bigger, livelier holiday resorts where you can really let your hair down. It’s all so gloriously Greek! 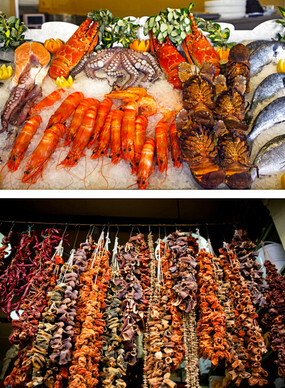 The food here is pretty special, with the freshest fish you’ve ever tasted. It’s hard to beat the pleasure of a long slow meal with local wine at a beachside taverna as the sun goes down. Corfu is a magical place of lush valleys and rolling hills with a dramatic mountain backdrop lavishly covered in cypress and olive trees. 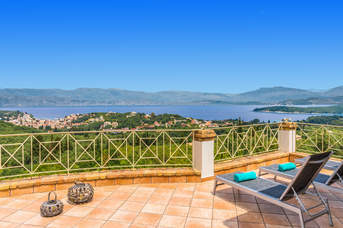 You can opt for a villa in a tiny secluded village for total peace and relaxation, and from there visit Corfu Town. It's got layers of history to explore including churches, narrow cobbled streets, fine museums and two fortresses. Take a break from sightseeing in the excellent restaurants, bars and pavement cafes and hidden leafy squares. Hiring a boat is a most enjoyable way to explore the extensive coastline where you'll discover hidden beaches and coves, some only accessible by sea. Or let someone else be the captain and join one of the many tours which depart from the resorts. Most of us like to take something home to remind us of a great holiday, or we need to buy presents for the people we left behind. In Corfu you can find well-made interesting holiday souvenirs such as locally made gold and silver jewellery and other craftwork. You will find all kinds of things made from the local olive wood and very good soap made from olive oil (there are said to be 3 million olive trees in Corfu, but we haven’t actually counted them!) Locally made ceramics, lace and embroidered linen are inexpensive and good quality. Just beyond Avlaki on the other side of the headland is the Erimitis Nature Reserve, about 450.000 square metres (about 45 acres) of wild, natural beauty. Its 3 freshwater lakes are of vital importance to migratory birds, and the whole area is a valuable ecosystem and of great environmental importance. Corfu is a brilliant island for horse-riding with a number of well-run riding stables to choose from, offering rides through a landscape of myrtle and gnarled, silvery green olive trees. There are many beautiful tracks to follow, giving you a quite different view of the island’s rich landscape. If you want to explore the island’s beaches, you have a rich and varied choice. For example, Avlaki Beach is a long curved stretch of white pebbles steeply shelving into warm, clear blue waters. In the middle of the beach is a dinghy sailing and windsurfing centre, a small boat hire jetty and an excellent taverna, popular with locals. Coyevinas feels like your own private beach, with no facilities at all - it is wonderfully relaxing and peaceful. The harbour at Nissaki is excellent for water sports with top notch training on hand. There is a large water sports centre where jet skis are available to hire and you can also have a go at water skiing, wakeboarding, ringo and banana rides and parasailing. This is also a great place for snorkelling and scuba diving with excellent visibility underwater. You might see starfish and purple urchins, exotic polka dot cardinal fish and neon damselfish, barracuda and morays. Once you are confident, you can try diving in deeper water where you might spot octopus or sea bass. The best way to fully appreciate the rugged and rocky coastline with its small secluded bays and beaches, coves and caves is from the water as the skipper of your own boat. Many of the hidden little beaches can only be reached from the sea, such as those that form part of the Erimitis Nature Reserve. You don’t even need a licence! You can hire a boat from most of our resorts. We have villas off the beaten track in the countryside, and many in the heart of the holiday resort with shops, bars and beach just a stroll away. We also have our Very Villa Plus selection, our personal favourites that we believe offer something a bit extra. 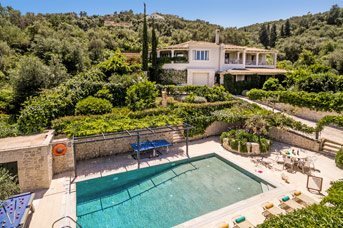 When you reach your gorgeous villa in Corfu, you may just want to lie by the pool, close your eyes, sip your cold beer and soak up the rays, far from your everyday worries. Or you may want to go exploring. However you spend your day on this luscious Greek island, it ends in a beautiful house with everything you need to be happy and comfortable. A lovely, cool calm bedroom will be waiting for you after the heat of the day. Imagine swimming at dusk in your own private pool, planning the day ahead and marvelling at the day you have just spent in this magical place with the people you love best. Whatever you need to be happy on holiday, we are sure you will find it with us in Corfu. With its lush green scenery and some of the finest views in the Med, Corfu is the green jewel of the Greek Islands. Villa Plus offers a range of resorts in the northern part of the island, providing the perfect base to explore the rich culture, history and landscapes that this destination has to offer. 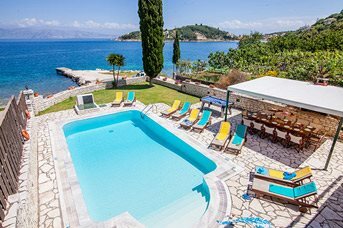 If you want a villa in a traditional village in a magnificent setting, Kassiopi, with its attractive, horseshoe shaped harbour bobbing with colourful fishing boats might be the place for you. It was originally a Roman settlement, and nestles beneath Mount Pantokrator surrounded by olive groves, vineyards and orchards of oranges and lemons. Or there’s the small fishing village of Agios Stefanos offering one of the best beaches in Corfu and a collection of waterside tavernas. For something a little livelier, Sidari on the Northern coast is a busy, popular town famed for its rich and varied nightlife is nearby. Looking for a family beach holiday? Barbati’s Blue Flag beach is one of Corfu’s best, with the sea slopping gently away from the pebbly beach. There are plenty of restaurants and cafes for a lunchtime snack or sunset cocktail. Whatever you need from your Villa Plus Holiday, we have the right villa in the right place to deliver all the great things you’ve been dreaming of, and then some more! Acharavi is the largest town in the northern part of the island. It has a life of its own beyond tourism, and is an important centre for local people all year round. It is a mainly modern resort with a full quota of shops, bars and restaurants offering a wide choice for visitors. Agios Ioannis is a laid-back, traditional Greek village, ideal for those looking to escape the crowds. Its central location means that is a great base to explore what the rest of Corfu island has to offer including a choice of sandy beaches on the East and West Coast. The relaxed atmosphere means you can while away the day with the locals among the stone cottages, churches and lush olive groves. Agios Ioannis is also home to Aqualand Waterpark – a great choice for families. One of the most popular resorts due to its attractive setting in a stunning bay, Agios Stefanos draws visitors back year after year. There is a choice of tavernas along the waterfront serving the catch of the day. The surrounding coastline has many small secluded inlets stretching along the north east coast of Corfu with little beaches that remain unspoilt largely because they have pebbles as well as sand. These villages have in the past survived through their fishing industry, and each has its own picturesque harbour, a few winding streets and a tavern or two. Between Agios Stefanos and Kassiopi on the north east coast of Corfu is one of the islands most attractive but least developed bays. The wide pebbly beach is surrounded by lush valleys and rolling hills with a dramatic mountain backdrop lavishly covered in cypress and olive trees. With just a couple of tavernas, it's the perfect place to escape and unwind. Barbati is an attractive village, built on a hillside rising up from a large and lovely white shingle beach. 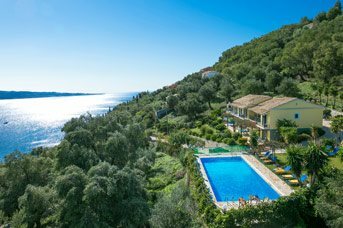 The village is surrounded by lush countryside with a dramatic mountain backdrop, pine trees and olive groves and stupendous views across to Corfu Town and the coast of Albania. Boukari is a picturesque fishing village located in the South of Corfu with lush green surroundings, breathtaking sea views and several tavernas lining the waterfront. The small shingle beach is ideal for families with its clear, shallow waters. Along the main coastal road to the North East Coast of Corfu is the attractive resort of Dassia, a bustling and lively holiday resort with a good selection of places to eat, a wide variety of shops and cafe bars. The long strip of pebbly beach is backed by a narrow promenade perfect for those evening strolls. Kalami, roughly in the middle of the North East of Corfu, is a beautiful horseshoe shaped bay that used to serve as one of the main harbours for transporting olives and olive oil to Corfu by local caique and as a base for the local fishermen. 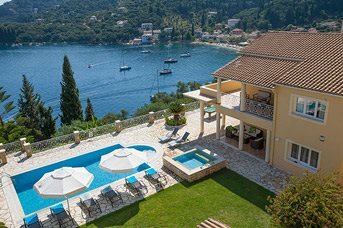 Kassiopi is a traditional village in a magnificent setting on the North East Coast of Corfu, the perfect place for your villa holiday. It was originally a Roman settlement, and nestles beneath Mount Pantokrator surrounded by olive groves, vineyards and orchards of oranges and lemons. The village is in a lovely elevated setting clinging to the hillside between the sea and Mount Pantokrator on steep slopes covered by gnarled, silvery green olive trees and pointy cypresses. It’s a small relaxed place with lovely countryside, a narrow, secluded, white pebble beach dotted with sunloungers and parasols and 3 little coves. The village itself was originally no more than a tiny fishing port and a monastery and so there is no real centre as such. There are however a good selection of tavernas, cafes and bars, with the main focus on its 2 lovely sandy beaches and small harbour. The area has a couple of good bars as well as both traditional and modern entertainment. One of the main attractions to the resort is the beautiful sandy beach. A mixture of sand and pebbles with shallow calm water, the beach runs alongside the main street for almost a mile. Boat trips and water sports are available from the jetty. This busy, popular town has more experience than most of making visitors happy and has much to offer, including great scenery, a 500-metre stretch of Blue Flag beach backed by a lagoon and nature reserve, unusual sandstone rock formations and lively nightlife with many pubs, clubs, bars and restaurants to choose from. Corfu’s rich historical, cultural and agricultural heritage have bewitched visitors to her shores for centuries. With a diverse and verdant landscape, over 200 traditional villages and miles of wonderful beaches, an elegant, cosmopolitan and beguiling capital town and a perfect Mediterranean climate it is easy to see why. There is plenty to see and do on this beautiful island. To simply explore the little villages and countryside along the coast and inland is a delight in itself. There are endless beaches to try out and for the more active or for children there are more modern attractions such as bowling centres and water parks. If you have a real sense of adventure there are also other islands nearby, the Greek mainland and Albania. Corfu has always had a significant role in Mediterranean history because whoever controlled Corfu had a good chance of controlling the vital east to west and north to south trading and military routes. So many different invaders came and went - the Greeks, the Romans, the Goths, the Byzantines, the Normans, the Neapolitan Angevins and the Venetians, as well as the French and the British. What remains is a rich multi-layered historical and cultural heritage that is still very much in evidence today with temples, castles and a wide variety of architectural styles. If you have a sense of adventure and an interest in history you can take the hydrofoil to Albania, a country that was shrouded in mystery for many years and closed to outsiders under communist rule. From Corfu Town the crossing by hydrofoil is just 40 minutes. Whatever kind of beach you fantasise about, you will find it here in Corfu. You can find small secret pebbly bays and idyllic coves that can only be reached by boat, or huge expanses of fine sand, complete with all the facilities you might need. There are child-friendly, gently sloping beaches with shallow waters and others with every kind of water sport you can imagine on offer. Most beaches on the island have a bar or two, and most have a choice of waterfront tavernas with marvellously fresh fish for your lunch or dinner. Many of our villas in Corfu are in small peaceful villages, but you are never that far from a lively taverna with live music and dancing at weekends. Holiday resorts such as Sidari are a great choice if you want to party after a long day by the pool, with plenty of clubs, pubs and music bars offering great nightlife. The locals are friendly and want you to have a great time – and you will! One of the delights of being on a small island is the variety and close proximity of its beaches. Corfu has a remarkable range of lovely beaches to offer from long sweeps of golden sand to tiny pebbled bays and coves. What they all have in common is crystal clear water and little or no tide. The East Coast of the island has predominantly pebbly or shingly beaches. There are some wonderful little hidden inlets for those that explore (particularly by boat) and other long tree lined sweeps of white pebbles with water-sports, sun-loungers and the ever enticing turquoise sea perfect for swimming & snorkelling. The far North and West coasts offer a complete contrast with long strips and bays of golden sand. Some of these beaches get very busy in the Summer months with their inviting shallow waters and water sports facilities - some (for the more adventurous) remain almost deserted even in the height of Summer. Whether you prefer being utterly lazy and just soaking up the rays with your sun lounger, umbrella and cool cocktail or are more inclined to be active and adventurous, Corfu beaches offer something for all. A huge horseshoe shaped bay with a lovely sandy beach and beautiful scenery Agios Georgios on the North West (there are 3 Agios Georgios beaches) is particularly beautiful seen from the coastal road that leads to Paleokastritsa. The beach is long and sandy and has various watersports available and there are a few tavernas and shops along the shore. As well as a good sandy beach it is also a lovely area for walking. The inviting bay of Agios Stefanos ('East' not to be confused with San Stefanos on the West coast) has two small harbourside beaches but is better known for its charming village and beachside tavernas. A popular stop for boats with plenty of jetties to choose from and a gentle traditional atmosphere, it is a wonderful place to stay and well worth a visit, particularly by boat. Agni Beach is a narrow stretch of pebbles set in a bay at the bottom of an olive and cypress tree valley. With three traditional beachside tavernas all ready to feed and entertain you. The beautiful scenery makes it a popular stop for boats of all sizes. A short walk around a small headland brings you onto another quiet shingly beach that is excellent for snorkelling. Just past the beach and lagoon of St Spyridon starts a long stretch of sandy beach about 7 kilometres long. Almyros is at the start of this stretch and is the least commercial section with sand dunes and a couple of nice tavernas near the sea. A short distance around the headland from San Stefanos (West) is the sandy beach of Arillas. A good sandy beach with a bustling resort, Arillas Beach is long and narrow with sand dunes at one end and lovely views from the seaside tavernas. One of the most attractive beaches on the North East Coast, Avlaki has its borders in the Eremitis nature reserve and has a small lagoon which is a nature lovers delight. The beach, a long curved stretch of white pebbles shelves into the brilliantly blue and fresh sea and there is almost always a cooling breeze blowing across the wide bay. There is a very good taverna in the middle of the beach and another slightly further along, plus sun loungers towards the centre, a windsurfing/dingy sailing school and small boat hire jetty. Barbati has a beautiful, long, pebbly beach (approx 2km) that caters for everyone. The South end is quiet, lined with trees, has no sun loungers and is great for snorkelling. As the beach continues it gets gradually busier with plenty of sun beds, a good water-sports jetty, boat hire, local boat trips, a couple of low key snack bars, two with swimming pools, and a few residential areas set a little way back. As is typical of this coast the waters are clear, generally calm and deliciously inviting. Just past the centre of Sidari is the beautiful Canal d'Amour, a small but very attractive cove beach which sits between weather carved sandstone cliffs. The rocky platforms are ideal for sunbathing and enjoying the views, plus there are small caves underneath which can be explored from the water. The completely uncommercial beach of Coyevinas is a long stoney stretch of beach just around the headland between Avlaki and Kassiopi. Virtually undisturbed the beach is good for snorkelling and for peace and quiet. A 1 mile long narrow strip of shingle and sand, Dassia Beach is ideal for water sports lovers with its two jetties and generally calm waters. The two ends of the beach are more secluded and very pleasant for swimming whilst the central areas are generally more lively with several beachside cafes and tavernas, plus a very popular beach nightclub that serves as a pleasant bar by day and a lively club at night. This is a very small beach and is a mix of sand and pebbles. There is a taverna that offers homemade food and wine. Watersports are also available as are sunbeds, umbrellas and shower facilities. This beach has no lifeguard. One of the most beautiful and most popular beaches on the island Glyfada is a long wide sandy beach tucked away at the bottom of pine clad cliffs about 20 minutes drive out of Corfu town. There are various beach bars and tavernas towards the centre of the beach, volleyball courts, plenty of sun loungers, watersports and lovely swimming waters. The beach can get very busy in the Summer and at weekends though the two ends of the beach tend to be quieter. It is a beach you can easily spend a whole day on with plenty of activity for those that want it, more peaceful spots for those that don't and sunshine from 8am to 9pm in the Summer months, a lovely spot to watch the sun set. Imerolia has a delightful beach, located on the outskirts of Kassiopi on the north east coast of Corfu. Although the bay is pebbly, it provides the ideal opportunity for sunbathing and is also overlooked by a couple of tavernas if you need a break from the heat. The beaches and harbour of Kassiopi can be reached from Imerolia in a couple of minutes by car or within around 15 minutes on foot. A ¾ mile strip of shingly beach running alongside the road, Ipsos has two good water sports jetties, boat hire and boat trips plus two attractive local harbours where you can see the fishermen with their daily catch or enjoy a romantic stroll in the early evening. Kalamaki Beach is about 10 minutes drive along the North coast from Kassiopi and is the closest totally sandy beach to the town. A wide shallow bay with a couple of pleasant tavernas this beach is good for children as it has shallow waters for a good distance out. The large horseshoe shaped bay of Kalami is captivating. The beach is a long stretch of white pebbles and the azure sea is enclosed by low tree clad cliffs, perfect for swimming and snorkelling. Down a steep narrow road you will come to the little village and lovely beach of Kaminaki. Kaminaki beach is a curved bay of white pebbles and crystaline waters with two tavernas, some basic water-sports and a boat hire jetty. For the more active Kaminaki Beach is the start of a narrow coastal footpath that passes several enchanting bays along the coast including Krouzeri Beach, Agni and Kerasia. Kassiopi has one main reasonable sized beach to the North of the town with convenient beachside tavernas and snack bars. Several smaller, prettier beaches are a short walk around the two headlands leading from the harbour. Two of these beaches are large enough for a few sun loungers and have beautiful clear waters and shingle or pebbles and there are, for those that look one or two tiny little coves hidden away down footpaths from the main town. Kassiopi is also ideally situated to explore a little further afield by boat or car for the hidden pebble bays of the East or the long sandy beaches of the North. One of Corfu's well-kept secrets, Kerasia Beach is a wonderful, long, quiet pebbly beach tucked away between Kalami and Agios Stefanos. Tantalizingly close when viewed from the road, it is only accessed via Agios Stefanos or by boat. With one friendly taverna, a small tourist kiosk and a few sun loungers, it is a favourite with the local people and can get busy at weekends. In the week though it is rarely very busy and is ideal for swimming and snorkelling. If you take the road to Nissaki Beach Hotel, you will come to Krouzeri Beach. A long pebble and shingle beach in front and to the side of the Hotel Krouzeri, with a couple of very pleasant beachside tavernas, a water-sports jetty, sun-beds and lovely clear turquoise water. Towards the South of the island there are long stretches of largely wild sandy beaches. For those who like to explore, a four-wheel drive to the mouth of the Korission Lagoon and a walk takes you to acres of unspoilt sand dunes perfect for getting away from it all, even in the height of the Summer. The beaches further South of Agios Georgios, Marathias and Santa Barbara are all long stretches of sand with very little on them other than the odd few tavernas around the small resorts. Further South again the beaches can only be reached by foot or by sea with the exception of the furthest tip of the island where the infamous Kavos sits. Logas 'Sunset' Beach is on the far side of Sidari, in the village of Peroulades, on the west coast of Corfu. As its name suggests, this beach has wonderful views of the sun set in the evening, which are best enjoyed from the taverna which sits at the top of the cliff. It has a long strip of golden sand at the bottom of vast sandstone cliffs, which has stone steps down to the seafront. The area from Barbati to Nissaki is dotted with tiny beaches and coves for those that explore a bit or take the boat. Nissaki itself has a gorgeous little pebble and shingle beach with the most incredible tempting blue waters and a very good water-sports platform. With its lovely harbour, panoramic sea views and three seaside tavernas it is a popular spot and though it can get busy in the summer it is well worth a visit if only just to soak up the atmosphere and gaze into the crystal depths. Nissaki is also a popular fishing spot with the harbour-side rocks attracting a wide variety of fish and is also the main base from which you can pick up a boat trip with the traditional caique, for example Vivi - the best way to enjoy the coast. Paleokastritsa is known for its beautiful scenery and there are several small beaches around the coast, many of which are only accessed by sea or on foot. The main beach is a lovely sandy bay tucked between impressive rocks and cliffs. It tends to get very busy in the summer, has several tavernas overlooking the sea and is great for snorkelling. There is another smaller and quieter beach slightly set away from the village where you can hire boats and there are various boat trips that drop you off at beaches further away that cannot be reached by car. A short distance down the coast from Glyfada is Pelekas Beach. Down a long narrow road is this lovely sandy beach set at the bottom of the tree-clad hillsides so typical of this coast. It has a couple of small tavernas, a smart hotel and plenty of golden sand. Roda Beach is a continuation of the bay at Acharavi. The beach is a mixture of sand and pebbles, with clear, shallow water, ideal for snorkelling or scuba diving. The beach is around a mile long, with the resort running parallel to the seafront. Water sports and boat excursions and hire can also be found here. San Stefanos on the West coast offers a complete contrast to Agios Stefanos on the East. A long wide sandy bay sheltered by sandstone cliffs, San Stephanos is a lovely beach for sand lovers. There are plenty of sunbeds and various watersports available. The resort itself has good facilities and plenty of places to eat. Sidari has a lovely sandy beach, right in the centre of the resort. In recent years, whilst the beach is still attractive and has various water sports available during the summer, the resort itself has become very commercial. St. Spyridon Beach is a lovely sandy beach backed by a lagoon and nature reserve about a 15 minute drive North West of Kassiopi. With shallow waters and golden sand it is popular with children and families and is also a favourite spot for walkers. Across a small bridge is a track that, with a four-wheel drive or steady walk, leads to a couple of alternative, largely undisturbed,]little beaches hidden away behind trees and fields. Yasliskari Beach is a one of the smallest beaches on the western side of Corfu. The fine sand against the turquoise sea waters, with the pine trees located around, makes this beach an ideal place to sit back, relax and watch the world go by. Corfu is blessed with exceptional cuisine. Sharing a spice palate with ever-popular Italian cuisine, Greece's Corfu enjoys a really wide range of dishes, from salads with Feta cheese to slow-cooked lamb with rice, the flavours are familiar yet new at the same time. From traditional tavernas (restaurants serving traditional Greek food) and estiatorios (more upmarket and elaborate restaurants) to the understated kafenions (café/bars) and various street food vendors that line the streets on market days, eating in Greece is a way of life – and there are many places for you to join the locals in the most favourite national pastime, eating. The vegetable and fish market in Corfu Town is one of the most renowned markets on the island – most others are somewhat impromptu and varied in stock. The Corfu Town market is a big attraction for locals and visitors alike, and you can find it just under the New Fortress walls. Here, you'll find ripe fresh fruit and vegetables every colour of the sun, along with fish that's been caught just off of the island earlier that day. Some vendors can be found cooking the fish freshly then and there, making a delectable morning treat. Greece is the owner of many staple dishes. From the humble yet delicious Greek salad to the more complex dolmades (vine leaves stuffed with lamb and rice) and stifado (a rich, slow cooked beef stew), Greek food embraces everything that nature produces best. Corfu is no exception to this, and creates iconic Greek food such as moussaka (baked layers of aubergine, lamb and cheese) and tzatziki (a cucumber, garlic and herb yogurt dip) as confidently as the mainland. Pastitsatha – a spicy chicken served with pasta, is served in some form at most island restaurants, with chicken substituted for fish in port towns. This dish then becomes similar to the Bourthetto. Bourthetto– a dish usually prepared with black scorpion fish which sits in a spicy red sauce. Bourou-Bourou – a vegetable and pasta soup. This dish is a great way for the Greeks to use up the abundance of vegetables their climate produces. 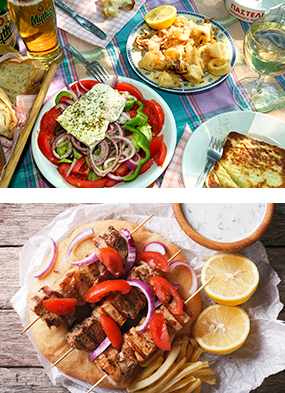 If you'd like to give some of the native dishes a try before you arrive in Greece, there are delicacies that are incredibly easy to create yourself at home. For a starter, try tzatziki with warm pitta bread, and as a main, you can't go wrong with a relaxed stifado, perfect served with roast potatoes and Greek salad – these recipes serve around 6 people. Don't be put off by the large list of ingredients – most of these will be sat at the back of your cupboards! On top of that, the method of creating such an incredible meal couldn't be easier. 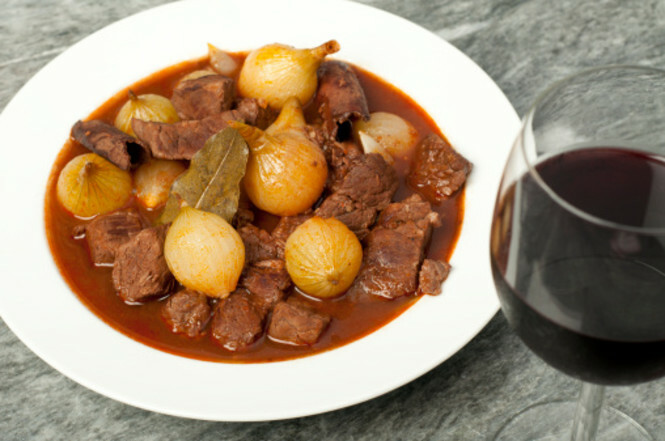 Whether you're using a slow-cooker or a casserole dish, the first bit is the same – mix all of the ingredients except the beef together before adding no more than 1/2 a litre of water – the consistency should be gravy-like. If you've got a slow-cooker, add the beef and put it on a medium setting for around 6-8 hours, until the meat is cooked and falls apart in your mouth. If you're popping it in the oven, sear your beef, shallots and onions in a frying pan before putting it in the dish with your sauce. Pop this in the oven for 1-2 hours, keeping an eye on the sauce level whilst cooking – add water if necessary. Serve up with crispy and fluffy roast potatoes and a freshly prepared salad with feta cheese – absolutely perfect.